What should I do if my account got disabled? For various billing reasons (e.g. your credit card has expired, your PayPal account has been disabled, insufficient funds, etc. ), a subscription can fail to renew. When this happens, your Easy Blog Networks account gets disabled when the Subscription Valid To date expires. Note: You can find your account's validity date in the Settings page. 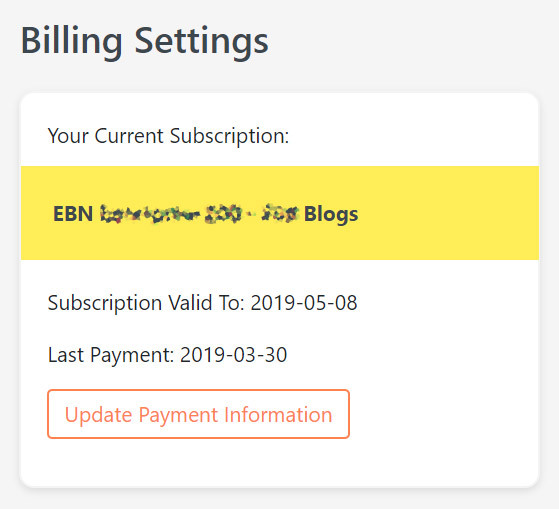 To re-enable, you need to update your billing information by logging in to your EBN account. Existing users are no longer eligible for the free trial. The system will automatically detect this and bill their account for the full monthly subscription in the next 24 hours.